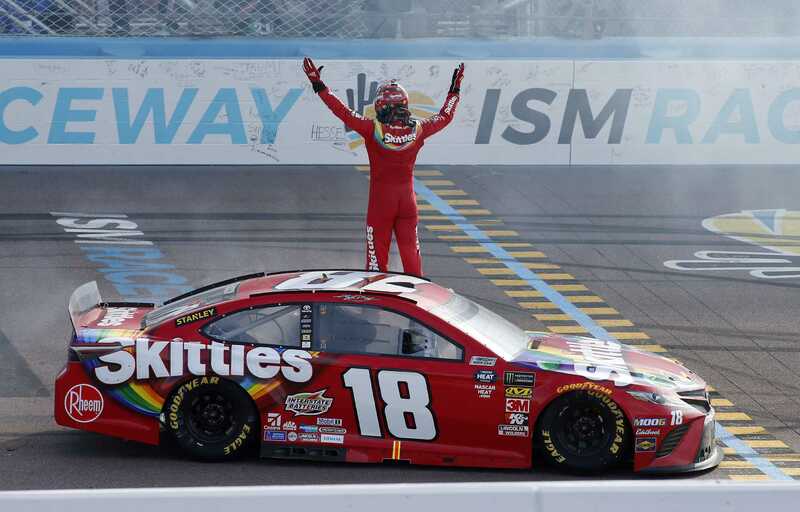 Kyle Busch took over the lead with 15 laps left and never looked back, winning the TicketGuardian 500 to finish off a weekend sweep of both events at ISM Raceway in Phoenix. The two wins give Busch 199 career wins over NASCAR’s top three series, including not only the NASCAR Cup Series but also the Xfinity Series and the Camping World Truck Series. Last weekend in Las Vegas, Busch won both the Truck Series and Xfinity races to set up the potential for a rare three-race sweep – a feat only he has accomplished, doing so twice at Bristol during his career. But a speeding penalty during the NASCAR Cup Series race dropped him back, and he was only able to work up to third place by the end of the day. Busch made his move following a restart on Lap 239 of the 312-lap race. Working his way up from fourth, he stalked Ryan Blaney for over 30 laps before finally making the go-ahead pass on Lap 296. That was enough to give him the win, as he was able to nurse his car to the finish before he could be caught from behind. Both Busch and Blaney had pitted on Lap 221, putting them in a precarious position, as their fuel tanks weren’t projected to last until the end of the race. But both managed to get to the finish without coming seriously close to running dry, though Blaney had to make an effort to save fuel in order to do so. That allowed Martin Truex Jr. to climb all the way up to second place. Over the last 22 laps, Truex made up about seven seconds on Busch, but that still left him 1.259 seconds behind the leader at the end of the race. Busch is now close to hitting the magic number of 200 NASCAR victories, which would tie him with Richard Petty for the most ever. He may well accomplish that feat as early as next week, when he will again be racing in both the NASCAR Cup Series and Xfinity races. But it’s worth noting that Petty earned all of his wins on the Cup Series, which may be why Busch himself even seems to be downplaying the significance of his achievements. Busch’s win and strong overall start to the season have moved him to the top of the list of drivers who could win the 2019 NASCAR Championship, at least according to bookmakers. Unibet has Busch as a 9/2 favorite ahead of Kevin Harvick (5/1), Truex (7/1), Kyle Larson (7/1) and Brad Keselowski (7/1) to take home the title this year.